The Centers for Disease Control and Prevention (CDC) is reporting that more measles cases have been reported in the first three months of 2019 than in all of 2018, and the number of cases is the second highest since the disease was officially eliminated in the United States in 2000. The CDC reported on Monday 387 measles cases between Jan. 1 and March 28, 2019. In all of 2018, there were 372 confirmed measles cases in the U.S., according to the CDC. 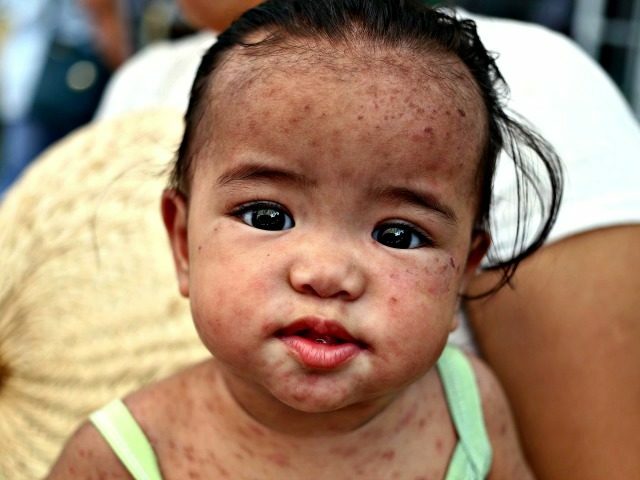 “These outbreaks are linked to travelers who brought measles back from other countries such as Israel, Ukraine, and the Philippines, where large measles outbreaks are occurring,” the CDC website states, adding that people should be vaccinated before traveling internationally. The CDC website explains that the federal government started recording measles outbreaks in 1912, and in the first decade of record-keeping an average of 6,000 measles-related deaths were reported each year. The reasons for the increase in measles outbreaks is due, in part, to international travel and a growing number of people who are opting not to have their children vaccinated against the disease and other communicable diseases. In January Washington state’s governor, Jay Inslee, declared a state of emergency after officials confirmed 31 cases of measles. But while outbreaks in the states of Washington and New York have made headlines, measles outbreaks in the first three months of 2019 have also been reported in Arizona, California, Colorado, Connecticut, Georgia, Illinois, Kentucky, Michigan, Missouri, New Hampshire, New Jersey, Oregon, and Texas. “Measles is so contagious that if one person has it, up to 90 percent of the people close to that person who are not immune will also become infected,” the website states. The CDC recommends children get two doses of the measles — or MMR vaccine — starting with the first dose at 12 to 15 months of age, and the second dose at four to six years of age.